A lot of social network users have a misconception about social media marketing. They think it comes down to posting funny pictures on your company page and expecting the audience to grow on its own, without any additional effort. I’ve been there once, too, but now I realize none of that is true. Posting funny pictures may be beneficial sometimes, but that’s not what social media marketing is about. In this article, I’ll briefly explain what social media marketing is, and how it can help your business grow and develop. You may already know that marketing is the way a business communicates with the outside world with the purpose or receiving revenue. Social media marketing, or SMM, as the name states, is a means of marketing that uses various social networks and their free and paid tools. Such tools are posts, sponsored posts, banner ads, targeting, and personal communication with potential or existing customers. Before you jump in or decide to abstain of using social media for your company, let’s quickly round up everything you can get as a business from using social media. Get to know who your target audience is. When you communicate with customers on social media, you get a better understanding of who your target audience is. You see who subscribes to your pages, and who doesn’t. You see who’s more engaged. You see who’s interested in your product or service, and what’s most valued in it. Being present on social media helps businesses understand what people really want regarding content too. You reach tons of people. The more your content gets spread across social media, the better the brand recognition is. A social media user is more likely to choose a brand that they recognize, especially if they see their friends leave good reviews, or if the content seems appealing. At the end of the day, of course, it all comes to the product’s value and ability to fulfill its task, but recognition is also very important. Engagement. On social media, engagement is any way a user can interact with the content—they can like, comment, share, and click on links and banners. Engagement rate (ER), respectively, shows how much people did interact with content in relation to all the people who saw it in their news feed. Traffic from Social Media. While some brands and agencies are perfectly good without getting traffic from social media and measuring their success with engagement and “brand recognition”, others like startups, small businesses and ecommerces need tangible results, as known as money. While selling inside the social networks themselves is possible, as well as getting leads, getting traffic from social media to your landing pages is a huge benefit that you should pursue if you work with social media. If you’re a small company, you should treat this as the main metric for all your marketing efforts. Well, sales, revenue, acquisition cost, and this. Cut the crap. Making people notice content on social media is complicated. Imagine your own Facebook or Twitter feed. Most likely, new content appears fast, and in large quantities. Now imagine you have to make your company’s content stand out in this flow of information. Doesn’t seem like a piece of cake, does it? Algorithmic feeds don’t help, either. The only way to survive on social media is to create and post quality content. A lot of quality content. Every day. A social media mess up goes viral in moments. A joke gone bad, unintentional (or intentional) insensitiveness, or a poor response to a client on social media may not only cost the social media manager their job but also make a hot mess out of company’s reputation. Check out this list of worst social media fails of 2016 to see what I’m talking about. Is there any special way they talk? After that, compose a value proposition — a brief understanding of how your product or service solves a customer’s problem. The answer is — try all of them that seem like they might be relevant. If you have no time to create unique content for every network, for starters, try posting the same thing to every profile. 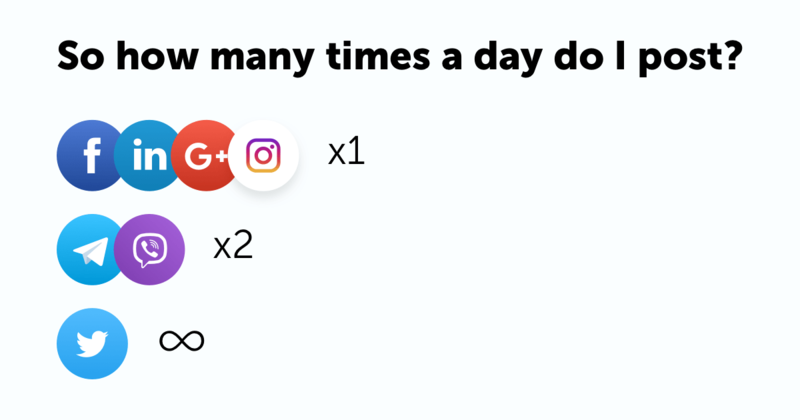 That will save you much time, especially if you’re using a social media scheduling app that allows scheduling to all social accounts at once, such as Amplifr. What conversions are the most important for your business? Make a list of the conversions from social media you think are the most important. These can be sales, signups, newsletter subscriptions, phone numbers, anything that is useful. Always put down the desirable results as numbers, not abstract goals. Then, after the campaign begins, you’ll be able to compare expectations and reality. If your business is still at a startup stage, your spend on social media can be minimized to sponsoring posts for better reach. You don’t need to hire a new employee to make content. Let your team tell the story. You can’t expect social media to become a working source of leads and conversions if you don’t sponsor the posts. Promotion is a must, and paid promotion is a must too. How do I check if the campaign is working? Watching engagement rate and audience growth is an important part of social media marketing, but not the most important one. With existing analytics suites, such as Google Analytics or Amplitude, you can track the conversions from social media. Define content value for the business. This is the goal the company wants to achieve by making a post. The company may want to introduce a product or a service, sell something, or increase the loyalty of existing customers. Be in touch with what your competitors are posting. Look at what they’re doing on social media. Compare it with your content. 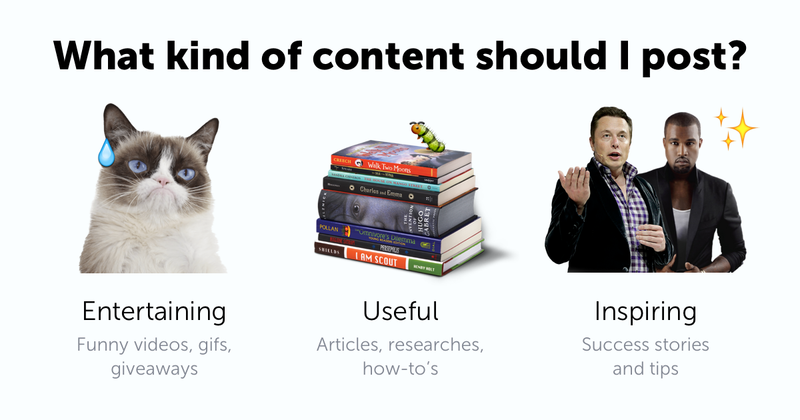 Put down the similarities and differences of your content strategies. Try to understand your strengths and weaknesses. Decide who’s in charge of creating content. If you’re working at a startup or a small enterprise, there’s no use hiring a social media manager right away. Anyone on the team who has some spare time can write a story worth sharing. However, you should remember that content is more noticeable if you have a picture or a video attached, so it may be worth investing in illustrations for starters. When you’re planning a content schedule, it’s important to keep in mind that users of social networks have various patterns of interacting with content. For example, it’s best to post to Instagram once a day, but never more frequent. Twitter, on the other hand, is perfect for posting whenever you feel like it. Facebook is a whole another story. Long story short, its algorithmic feed was designed to deliver more quality content to the users. The criteria for deciding whether the content is worth showing in the feed are the number of reactions received in the first hours after posting, and also the frequency of posting. Facebook algorithms don’t think a person or a page can deliver quality content three times a day, so if you post a lot, your content will receive smaller organic reach — i.e. your posts won’t show up in the feed. What are different kinds of Conversions and how your Analytics suite may unintentionally lie to you about their source. Subscribe to our Twitter and Facebook to make sure you don’t miss Part II when it comes out. If you have any questions, hit us up on social media or drop us a line.